Love it! This is still one of my favorite fragrances and was happy to find it at such great price here. Accentuate your natural beauty each day with the classic fragrance from Burberry. With notes of citrus and a pleasing blend of floral, sweet and spicy scents, this alluring fragrance can be worn any day. This fragrance is light and delicate, making it suitable for any setting. Burberry London is my favorite scent right now. Very floral without being too sweet. This is a great value! This perfume is a wonderful delightful one! When I saw the price I had to go for it. It used to sell for over 80 at Macys. That aside, I think it's being discontinued, I'm not sure why! It's a beautiful blend of soft floral scents. My favorite is the Jasmine, but here's what the website says: clementine and honeysuckle. Features tiare flower, jasmine and peony as the heart notes. Finished with sandalwood, veil of musk and patchouli as the dry down notes.MMMM, good deal, good perfume, a little too soft, I wish it was a little stronger. Timeless feminine classic scent that lasts! I have been wearing London for several years and was very disappointed to find out it was no longer available in most department stores. Searching for it online, I was very excited when I found the 3 ounce spray at Overstock.com for half the price that I normally paid at department stores so I bought two bottles last year and reordered a third today! I love the subtle scent of flowers like honeysuckle, English rose and jasmine combined with soft musky tones of sandalwood which gives it a sophisticated feel that is not overpowering but lasts all day. From the packaging to the design of the textile on the bottle, London has that classic timeless European feel and since I wear it daily there are always compliments. Great scent! I love it! I highly recommend Burberry London Women’s scent. I love this Eau de Parfum and it lasts all day. I love this fragrance! My favorite! Love the woodsy scent. Not too strong whereby others can tell when you are approaching. I use it for both work and outings. I keep returning to O... This particular fragrance is becoming increasingly hard to find. I get it here at a fraction of the price I’d pay at a Department Store. Pleasant, but didn't seem as concentrated as the Burberry London I buy from ***'s, not 100% sure this is not a knockoff. This is the fragrance I always wear. At dept stores it's over 100 dollars for this size bottle, much better deal here. It arrived timely and very protectively wrapped. This is the best perfume at the best price! Anywhere else this perfume is almost double the price! Love overstock!!! I gave this as a gift she said she liked it and would give it as a gift for someone. She likes the scent but not so much for herself. Plus the delivery service took along time to deliver it. True to picture. Thank you! I really love the smell of this perfume and how the scent lasts all day. I can't find it in my department stores so I was excited to get it here. I would recommend this. It's a big bottle for a good price. A little bit went a long ways. Love the cute bottle. Smells amazing. Yes it was, I've had it before and purchased from Macys. Yes this perfume is authentic. My wife has been wearing this scent for awhile and truly loves it. "What is the difference between the two Burberry London women 3.3oz eau de parfum sprays you have on site this week?" 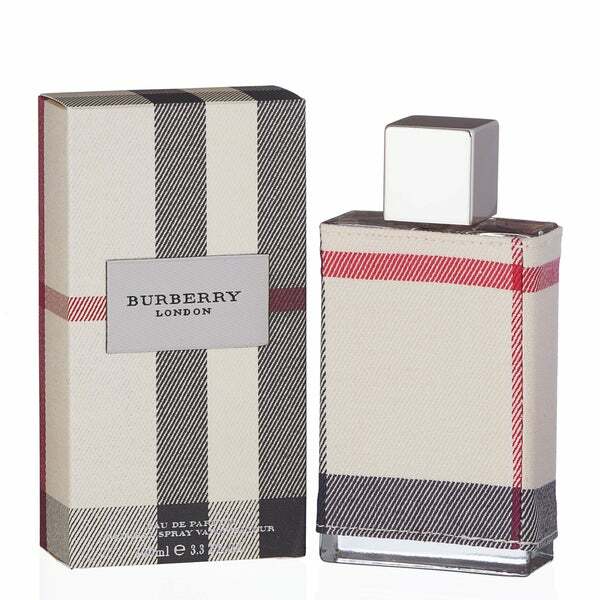 The cloth wrapped Burberry London was the original and had a light long lasting scent that I received compliments on each time I wore it. The London Brit came out after. Although nice it was "stronger" and I didn't like quite as much. 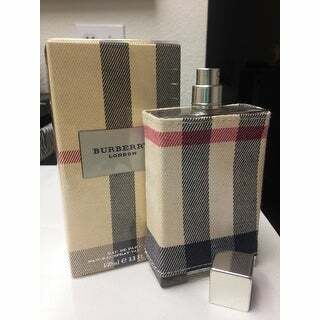 Then came the slightly oval bottle without the cloth wrap also called Burberry London. Again, it has a nice smell, but just not the original I enjoyed so well. The dark colored cloth wrapped bottle is the men's cologne which is stronger yet. I ordered the original plaid (black grey & red) cloth wrapped bottle here after looking for it in many stores. I'm glad I found it, but it does not seem to last as long. The fragrance diminishes much sooner than my original bottle about 10 years ago. Sometime people should just leave a good product alone and not change it! Suggest you stop into a store and test the ones available and pick your preference. I enjoy all my Burberry's but they are not all the same. "This product is priced substantially lower than any other retailer I've been able to locate (50% off). Is this verified to be the real Burberry London EDP? What is offered to provide verification?" Hello emarbau, I'm glad your happy with our prices. Yes this is authentic and will come in the original manufactures packaging. Have a great day! "Bottle states EdParfum and so does the title on the top, am confused as description says EDT. I would like to know excatly what I am buying as it states two different things." Hello lauraiko, This is not an EDT but a Eu de Parfum. Thanks for shopping with us! This has conflicting responses this one answers EDP and the next answer (oct 5) says EDT, which one is it? "Could you please confirm if this is EDT or EDP? Both EDT and EDP are included in the description. Could you please clarify which it is? Thank you in advance."